The depository's first function is to be a custodian : in relation the Central Securities Depository (CSD), it ensures securities settlement, as well as corporate actions upon securities for which the depository has been mandated for as custodian. Investors (asset managers & standard fund managers) gradually outsourced the asset management's peripheral activities to depositories. 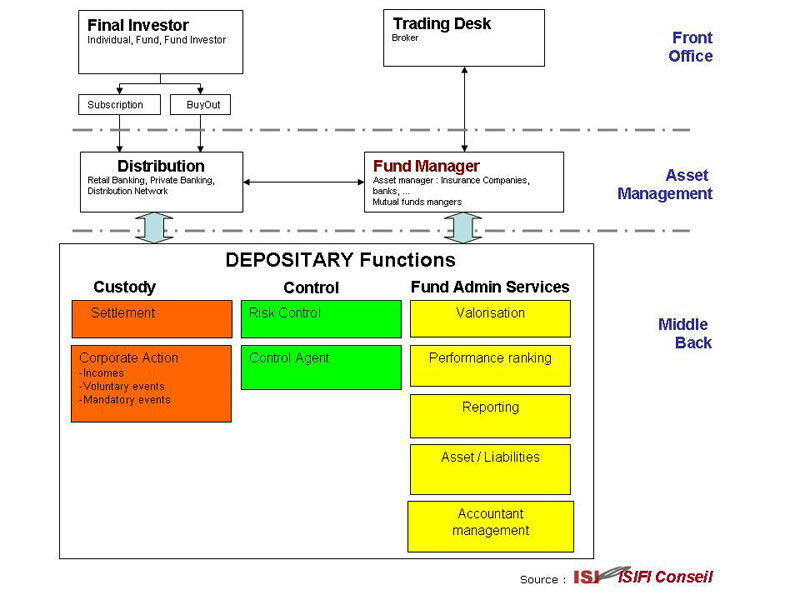 What used to be, within asset managements' companies, considered to be middle office oriented operations, are most of the time, outsourced to depositories ' “Fund Admin Services” Dpt. Depository control : When a depository is a standard fund's custodian, it has to certify that the fund is legally compliant with the characteristics that had been given to regulation authorities such as the AMF for France. Do not confuse Depository and Central Securities Depository. The Central Securities Depository registers the totality of the securities (shares & bonds) that are part of each issue accepted for its operations. In France, the CSD is known as Euroclear France (former Sicovam). This table explains the links between an asset manager & a depository. The asset manager's role is to allocate funds received from its distribution channels in regards to the selected investment characteristic. For this purpose, the asset manager intervenes in the stock Market through a broker.